It was my birthday on Easter Sunday, so I felt justified in opening up a few nice elderly bottles from my stash. €15.90 from 64wine, Glasthule; Baggot Street Wines; Green Man Wines, Terenure; Blackrock Cellar; Le Caveau, Kilkenny. An organic wine made by a Frenchman who set up in the Curico Valley in Chile. Gerard Maguire in 64wine, Glasthule first put me on to this wine. It is a delicious plump Chardonnay, with great purity of fruit and a lovely freshness. €20.99 from Cabot & Co., Westport or On the Grapevine, Dalkey. Miro came over for the Knockranny Wine weekend, and put on a fascinating tasting of his wines. 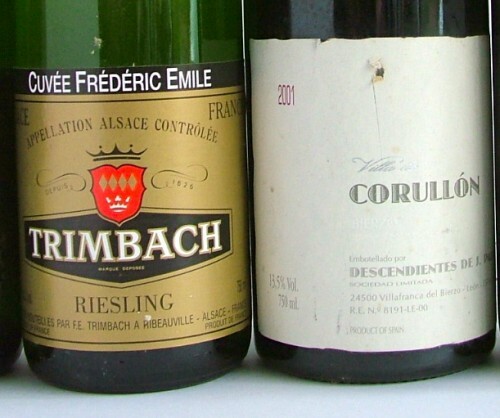 Included was a Traminec, or Gewürztraminer. I am guilty of ignoring this grape, mainly because I grew tired of the overblown aromas, flabby fruit and residual sugar that you so often find. 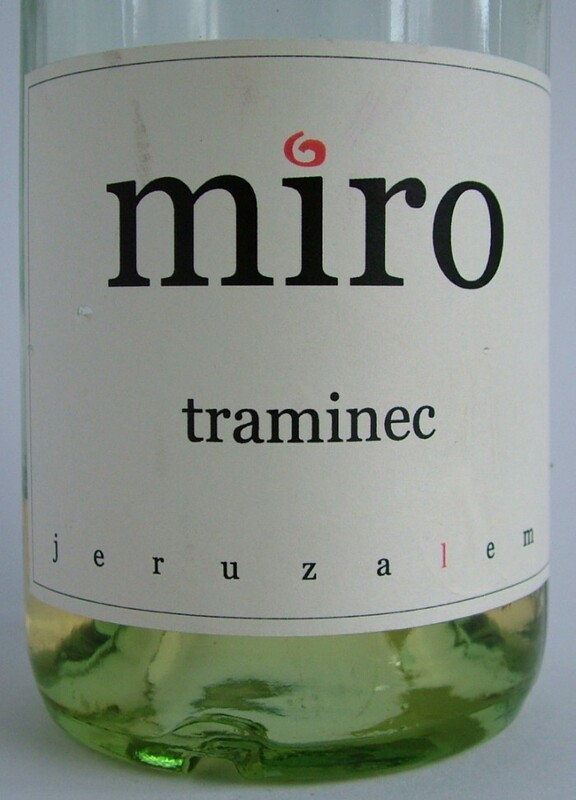 Miro’s version however was lovely; lightly aromatic, spicy nose; soft textured lychees on the palate and good length. A charming wine to sup by itself or I suspect it would go nicely with Chinese or Thai food. We didn’t open up the bottle of Bollinger in the picture above for various reasons. The Brut Nature, has no residual sugar, unlike most Champagnes that have 9-12 g/l. It showed in the bone-dry, austere finish. I loved it, but others were a little less sure. It didn’t stop us polishing off the bottle before dinner though. Light crisp apple and brioche with an elegant bone dry long finish. Nice wine. 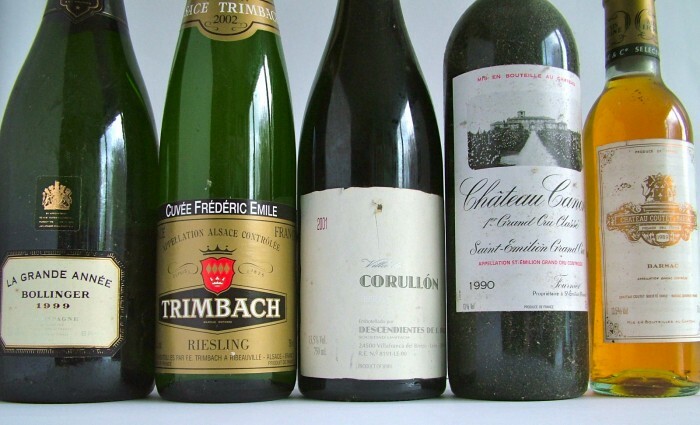 The current vintage costs €50 – 60 a bottle. One of my favourite white wines, and this bottle, the last of a case I bought, was superb. Elegant and restrained, with perfectly mature fruit. Toasty, nutty and honeyed, with plenty of acidity, I could have sipped it all evening. Despite the price (around €50) I still believe this is one of the best value white wines. It is made from several Grand Cru vineyards, and is less expensive and more consistent than most grand cru white Burgundy. This had been stashed away for the best part of a decade. As I had just finished a tasting of Bierzo, I thought it might be nice to try a mature version. It certainly didn’t taste ten years old with sour cherries, plums and a strong mineral streak. Good length. The leftovers were nice the following day too. Nice without every bowling me over. I bought this around fifteen years ago; elegant and maturing with an attractive leafiness and some restrained plum fruits. It still had some tannins on the finish. Opened out nicely and went very well with my roast pork. Very good rather than excellent. Rich marmalade and honey fruits, with a tangy long sweet finish. Very tasty, lacking the complexity to be really great, but a very nice wine.